Members of the Scarlet Guard showing off the newly signed Accord with Their then-Majesties Byron and Ariella. 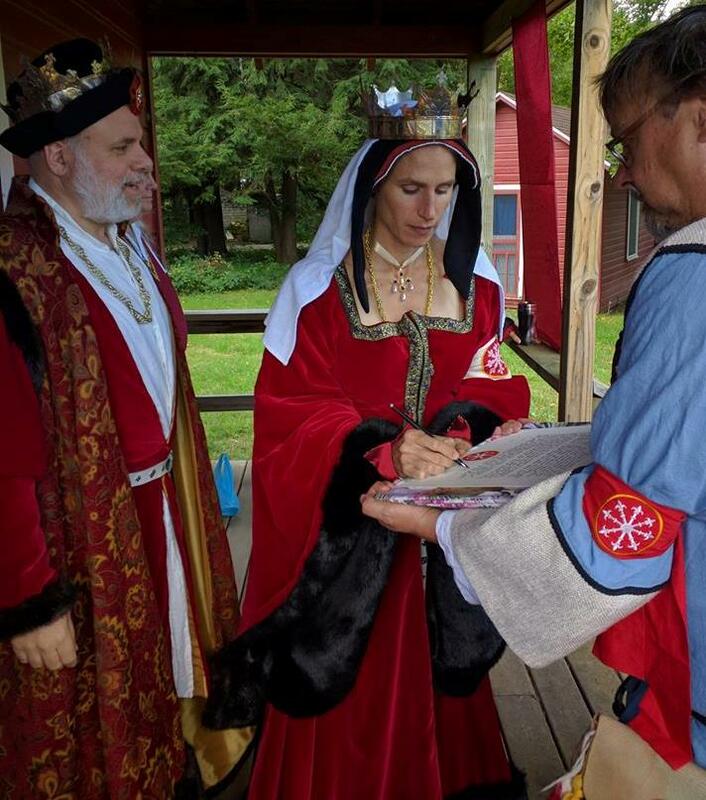 I am happy to announce that their Majesties Æthelmearc have signed the Scarlet Guard accord and it is now part of the policy of the Order of The Scarlet Guard. HRH Byron watches as HRH Ariella signs the Accord Master Urho holds. It is the desire of the Scarlet Guard to join some of the orders of other kingdoms in establishing a precedent for the recognition of their members as equals within our ranks. Whereas we perceive the Equivalent Orders from other Kingdoms to be equal in standing to the Scarlet Guard in the recognition of the areas of skill, service, noble bearing, and expertise relating to target archery. And seeing that these orders’ members are likewise conferred a Grant of Arms, or an Award of Arms and treated as a polling order, for such qualities by their Kingdom’s royalty, we wish to establish an acknowledgment of goodwill towards our fellow orders with this accord. To that end we extend to any visiting member of an Equivalent Order consideration of being equal in honor and rank to members of our Order of the Scarlet Guard. While visiting our lands they are welcome to our meetings and discussions of business of the Order, but shall not be added to message lists or groups, nor shall they be included as a voting member in any pollings. 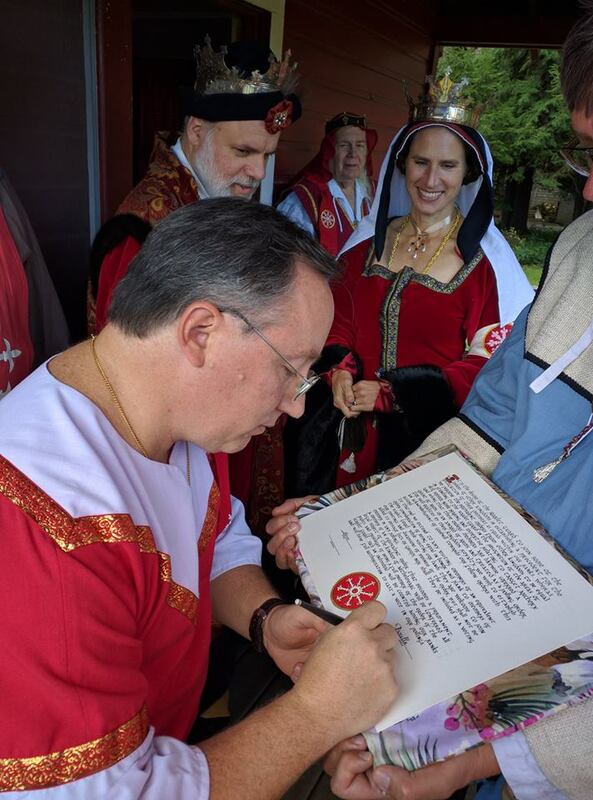 A member of an Equivalent Order that moves to Æthelmearc and becomes a permanent subject of the Kingdom, will be conferred all rights and privileges of being a full member of the Order of the Scarlet Guard. Master Juan was one of many Guards to sign the Accord. All photos courtesy of Master Juan.